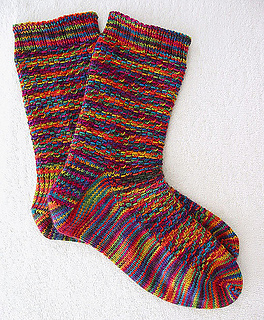 This design uses a simple textured stitch that enhances the glorious colors in Koigu. I chose a very bright colorway because this stitch pattern becomes lost in the darker ones. If you don't use the suggested color, go bright! Every stitch in this colorway reminded me of spring as I knit the socks in the dead of winter: tulip pink, crocus purple, azalea red, daffodil yellow, new-tree green. And why did I name this design Crusoe? Because the stitch pattern is stranded. It's a very simple slip-stitch textured pattern, with the yarn held in front - that's the stranding. The 4-round repeat makes it quick to learn. Knit the socks quite firmly. Two skeins are definitely enough to make the smaller size; if you alter the length of the leg, you'll need to buy one more skein, most likely.